Mix all ingredients first. 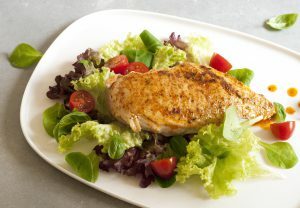 Take your chicken breast and cut it into equal portions; should be about 4 oz. each. Using a fork poke holes in the chicken breast on all sides several times. This allows the marinade to absorb into the chicken better. Marinade in the refrigerator for at least 30 minutes. Preheat the oven to 350°. Tear off a large piece of foil and spray with Pam. Lay the chicken breast side-by-side on the foil and wrap tightly. Place the foil pack on a pan or dish and put in the oven. Check after 25 minutes. Thermometer should read 165° when it’s done.